Astronomers have observed that galaxies in the distant Universe have a star formation rate (SFR) at least 10 times higher than local galaxies. The reason for this is not yet clear. Either star formation was more efficient in the past, or young galaxies had more molecular gas, from which stars are formed. Until now, the molecular content of distant galaxies was known only for very luminous and rare objects, mainly galaxy mergers and quasars. An international team, including an astronomer from Paris Observatory, has carried out the first systematic survey of molecular gas in two samples of galaxies at redshifts =1.2 and 2.3, when the Universe was 40% and 24% of its current age. Their results reveal that distant star forming galaxies were gas rich, while the star formation efficiency is not varying much along cosmic time. The fraction of molecular gas relative to total baryonic mass at z= 2.3 and z=1.2 is 44% and 34%, i.e. 3 to 10 times higher than in local galaxies. Observations of molecular gas in galaxies as a function of cosmic epoch are required to understand how galaxies have turned their gas into stars. 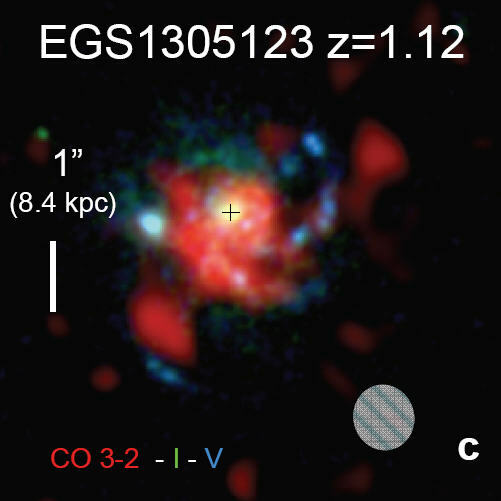 To explore the evolution of cold gas fractions, the team has selected two samples of star forming galaxies (SFGs) spanning similar ranges in stellar mass and star formation rates: one at redshift z 1.2 (5.5 Gyr after the Big Bang) and the other at z 2.3 (3 Gyr). These galaxies are selected to be .normal. massive galaxies, but not .starbursts. in a brief period of activity due to a merger. With the IRAM interferometer, 19 galaxies were observed, 10 at z 2 and 9 at z 1. For 14 SFGs there are solid detections in both redshift ranges, and for the first time for z>2 SFGs. In 5 galaxies the emission is marginally or not detected, or may be continuum rather than line emission. Figure 1: One of the object of the z=1.2 sample: the galaxy EGS1305123 at redshift z=1.12. 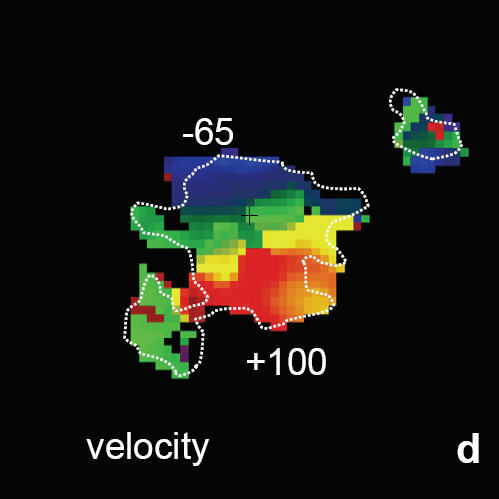 Left: Superposition of the map of the CO line (red, obtained with the IRAM interferometer), with the I-band (green) and V-band (blue) images obtained with the Hubble telescope. The CO(3-2) line is redshifted at 2mm wavelength, and is mapped at a spatial resolution of 0.6"x0.7" (beam indicated by the grey hatched ellipse). Right: Velocity field of the galaxy: blue means negative velocity (approaching), and red positive velocity (recessing). Cold molecular hydrogen (H2) does not radiate, and is traced by the most abundant molecule after H2, carbon monoxide CO. The CO(3-2) line map in EGS1305123 (z=1.12) is compared in Figure 1 with optical maps obtained with the Hubble Space Telescope. This system looks like a nearly face-on, large spiral disk. The CO emission is clumpy, but extends over the entire disk, with a strong concentration of gas near the nucleus and innermost spiral arms. These clumps are similar to, but larger than conglomerates of molecular gas in z 0 spiral galaxies. The CO dynamics traces an ordered rotating disk pattern with maximum rotation velocity of 200 km/s. The fact that the molecular disk is in a quiet rotating disk (and not in a perturbed merger), with clumps similar to those in nearby galaxies, suggests that a normal conversion factor between the CO emission and H2 densities is justified. The derived molecular gas fractions, defined as the ratio of gas mass to the sum of gas and stellar masses, range from 0.2 to 0.8, with an average of 0.44 at z=1-2. Distant galaxies are 3 to 10 times more gas-rich than nearby galaxies of the same mass. The present survey thus provides direct evidence that high-z galaxies are much more gas rich than local ones, for the same total mass. Although the z=1.2 sample has slightly lower gas fraction than the z=2.3 one, the gas consumption is so rapid at the high measured SFR, that the observed gas fractions imply a large amount of cold gas accretion to replenish galaxies in molecular gas. Figure 2: Star formation rate (SFR) versus stellar mass M*, for the z=1.2 (Left), and z=2.3 (Right) galaxies. The CO-observed galaxies are marked with the coloured symbols. The best fit (red line) is SFR proportional to M*0.8 (1+z)2.7. The slopes of the two red lines are the same (0.8) on the two graphs. The lines derive the one from the other by a vertical translation representing a factor 3, coming from the dependence in (1+z). The latter is mainly due to the gas abundance, and also to a slight variation of the star formation efficiency with time. In summary, this work demonstrates that the large star formation rates at z 1-2 are the consequence of the large molecular gas reservoirs and not of a greater star formation efficiency than at z 0 (cf Figure 2). These observations are a first step towards understanding the evolution of gas supply as a function of cosmic epoch, that will progress considerably with the Atacama Large Millimetre Array (ALMA). The mass of the dark matter particle: is it in the keV range?